Originally made for Valkyrian Music. 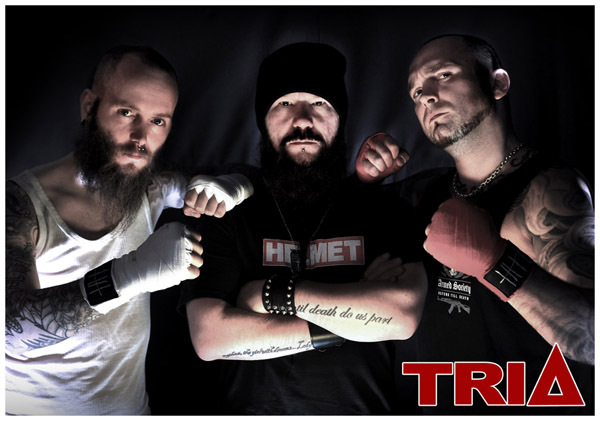 Three talented musicians with different musical backgrounds joined forces and TRIA was born. Pieni asked one of them – singer Magnus Klavborn – a few questions, so we can get to know the band a little better. Pieni: Hi Magnus! Thank you so much for talking to us. So, for what I understood, TRIA started out as one of J. Bergman’s (MAN.MACHINE.INDUSTRY) projects. Do you and Ronnie (Nyman, ALWAYS WAR) now contribute to the music more than just with your voices? Are you now involved with the writing process as well? Magnus: Me and Ronnie are doing all things vocal and we are very involved with the producing side of it all as well. We treat Bergman’s songs as templates, you can say, and then the three of us work out the rest to make it sound as we want it. P.: You describe yourselves as “a more violent version of AC/DC and Danko Jones”, so one could think that you’re a harder kind of hard rock… ? M.: The guitars and the sound of it all are kind of rock more than metal and the more violent part is on top of the rock pieces. P.: “Now it’s time for me to rise, to make a change and make it now”. Do you want to tell us a little more about those changes, about what “Stand My Ground” is about? P.: TRIA… the name comes from the fact of the band consisting in three frontmen with somewhat distinct musical backgrounds, or is there any other reason behind it? M.: You are right there, it started with me having an name idea based on “three” and then I think it was Bergman who came up with the name TRIA. P.: Both Ronnie and Bergman have other bands, which I believe are their priorities. What about you? Are you working on anything else or TRIA is your main focus at the moment? M.: TRIA is my main focus in music right now but at the same time it suits me, at the moment, that it’s a “second priority”. It gives me more time to do other things I need to take care of for now. 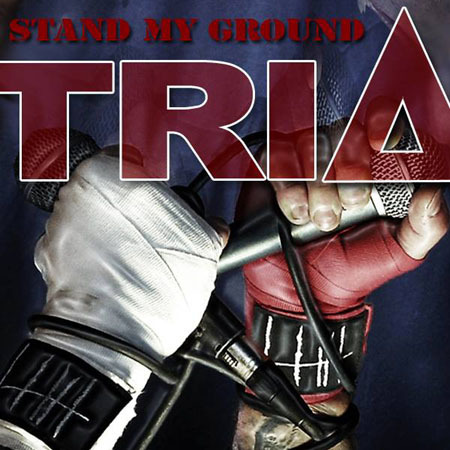 P.: The single “Stand My Ground” was out on June 28th. Are you already working on an album, or at least an EP? How’s that going? M.: We are working on a six track EP and not much left until it’s done! P.: I see CJ Sillén is listed as studio AND live session drummer. Are there any plans of hitting the stage in the near future? What ARE your near future plans? M.: CJ did a good job on those two songs for the single but on the EP it’s going to be Thomas Ohlsson (APOSTASY, ex-PROJECT HATE) and after the EP nothing is set in stone. TRIA is Ronnie, J.B. and me. Live musicians will be additional when it comes to doing shows in the future. P.: And speaking of CJ… Where did you find him? M.: That was Bergman and Ronnie so I don’t know the whole story on how he came to be playing on the single. But I’m glad he did though. P.: What about a bass player? I know Bergman plays it, but on stage he can’t do both… Are you still looking for someone or you’re considering skip the bass parts when playing live? M.: We don’t need to look We have already got plenty of them lining up. P.: I’m curious about something I’ve read on your Facebook page:“TRIA aims to fit many without becoming a commercial circus act”. This“commercial circus”, is that how you see the metal scene of today? A bunch of sell-outs? M.: The whole industry is fucked and most (not all) people working in the industry are fucked up greedy bastards who try to take as much as possible from the people in bands doing the ground work. P.: Once again thank you so much for this “chat” and I wish you andTRIA all the best. M.: Thank you. Stay true and listen to TRIA.